Join readers and writers of Vauxhall History (especially if you’re new here). All are welcome at a social evening to celebrate the official launch of the online archive vauxhallhistory.org, which is supported by The Vauxhall Society. This is a get-together for anyone interested in Vauxhall Past. 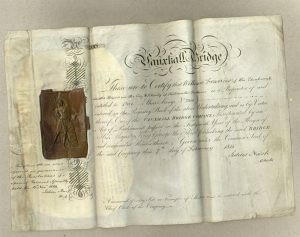 DAVID COKE, author of Vauxhall Gardens: A History, who will tell us about the first three Vauxhall bridges (today’s is the fourth) and a treasure trove of 1815 Vauxhall Bridge Company share certificates that has just come to light. ALEX WERNER, Head of History Collections at the Museum of London, who’ll take us back to Victorian times when the Vauxhall manufacturer Doulton & Company turned from making sewer pipes to fine-art pottery, along the way making of Vauxhall a centre for creative artists, potters and sculptors. NAOMI CLIFFORD, whose real-life Regency mystery The Disappearance of Maria Glynn has just been published by Pen & Sword History. She is also the author, as Naomi Lourie Klein of These Were Our Sons: Stories from Stockwell War Memorial. Your Mistress of Ceremonies is Edith Holtham, Chairwoman of our hosts for the evening, the Friends of Tate South Lambeth Library. Both library and The Tate Gallery are the gift of a Victorian resident of Streatham, the sugar magnate Sir Henry Tate. Both are the work of the architect Sidney Smith. Edith’s account of Lambeth Council’s long history of trying to do away with TSL, a vital community resource, is vauxhallhistory.org’s September feature. A contribution of £5 to The Friends of the Tate South Lambeth Library is welcomed. Also, on the afternoon of Tuesday 6 September: David Coke, co-author with Alan Borg of Vauxhall Gardens: A History will lead a vauxhallhistory.org guided walk, ‘The Heyday of Vauxhall Gardens’. September marked the end of the season for this world-famous open-air attraction. Kick-off for this walk (an hour or so long) is 2.30pm sharp, meet a bit earlier outside Starbucks, Vauxhall Station. A contribution of £5 to The Vauxhall Society is welcomed.